Amir Khan is confident he will overcome the long odds in his upcoming bout against WBO welterweight champion Terence Crawford. 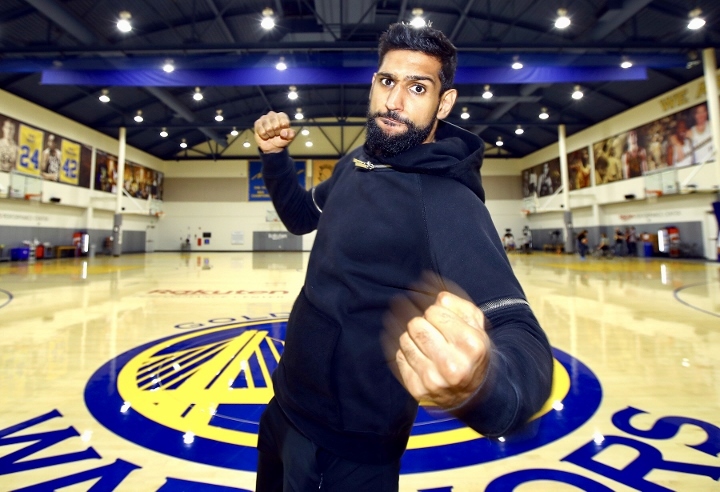 Khan challenges Crawford for his world title on April 20th at Madison Square Garden in New York City. To prepare for this fight, Khan went back to veteran trainer Virgil Hunter. Khan had been training with Hunter for several years, but briefly hooked up with Joe Goossen after Hunter became ill.
“I feel I’m better now than I’ve ever been. I’m more experienced and smarter as a fighter, and the speed is still there; people say the speed disappears as you get older but the speed is there. I’ve got stronger as well and I’m more professional; I can’t take the shortcuts I took when I was younger,” Khan said. Crawford, regarding as one of the best pound-for-pound fighters in boxing, is a three division world champion. He captured his first belt at lightweight, and then unified the entire junior welterweight division before a move in weight to 147-pounds. “There’s a year apart in age so he’s not the young spring chicken people are saying. I feel my speed, movement and IQ… and I do really well against southpaws,” Khan said.